I am so excited to share this recipe. 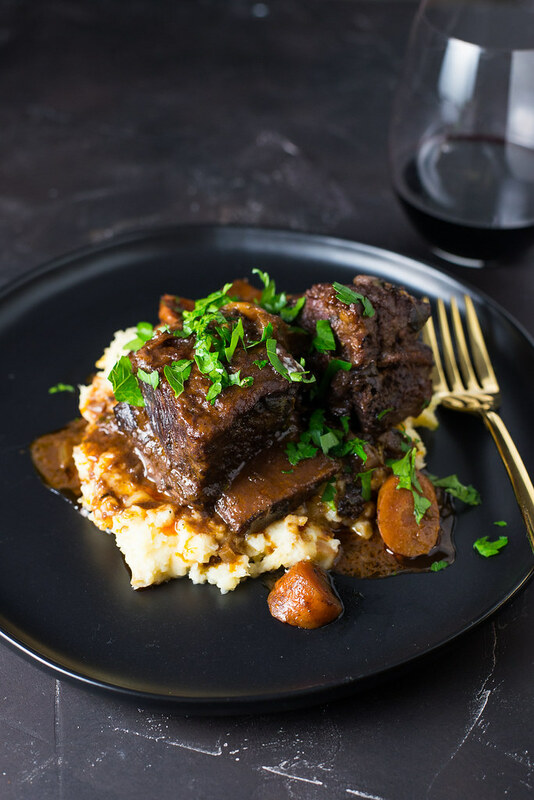 Braised beef short ribs are incredibly easy to prepare, not that expensive (especially since Whole Foods had them on sale recently), all made with ingredients you have in your fridge and yet, creates the most luxurious, deep succulent meal. This is in continuation of my New Years goal, going back to basics. Meals that we eat on the regular in this house. Good quality ingredients and big on flavor is all you need. Truth be told, we are complete homebodies. 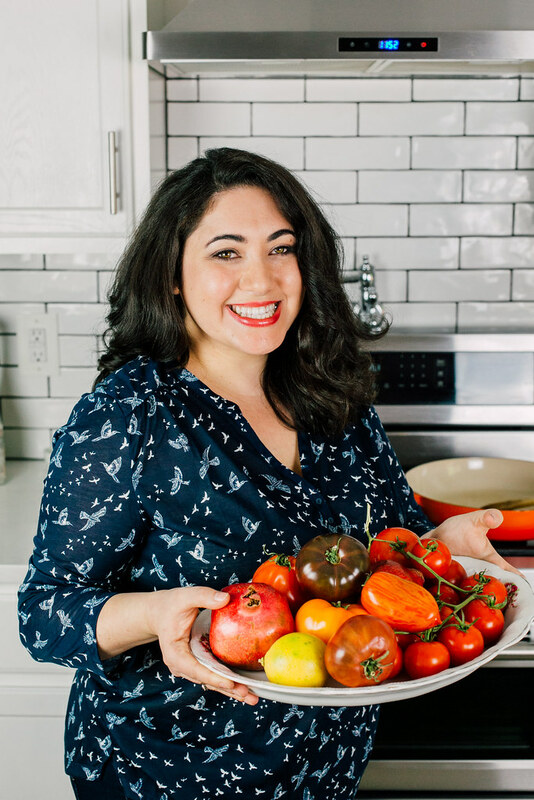 Call me snobby (it’s OK..I have thick skin), but we don’t go out to dinner much because we feel like we can make something just as good, if not even better at home. And honestly, braised beef short ribs taste way better in comfortable yoga pants, with Goodfellas playing in the background as you sip red wine and prep. Now back to the recipe. The ingredients are incredibly simple and I didn’t go overboard on extra spices or flavors. The combination of red wine, fresh herbs, some more aromatics and the beef create a gorgeous layered dish. Short ribs itself, are a flavor packed cut and once cooked down and get past the chewy stage, become incredibly fork tender and literally melt in your mouth. So take the time to go low and slow. Don’t rush the cooking and let the braise do all the work. There is a lot of fat that renders off, so take the time to skim the fat from the sauce so there is no extra coating, so to speak. Begin by heating a wide dutch oven over medium-high heat and drizzling with enough grapeseed oil to lightly coat the bottom of the pan and pre-heat oven to 350 degrees Fahrenheit. Season short ribs with salt and pepper on both sides and lightly coat the short ribs with flour on all sides, dusting off any excess. Sear the short ribs in the hot skillet on each side for about 2 minutes until outside is browned and lightly charred with a good caramelized. Once all short ribs are done, remove from pan and reserve to a plate. If there is any excess fat, turn off your heat and carefully pour out residual fat into another bowl to discard. In the same pan over medium-high heat, add chopped shallot and saute for 2-3 minutes until they begin to soften. You may need to add a bit more grapeseed oil if the pan is too dry. Then add the chopped carrot and celery and continue cooking for another 2-3 minutes. Add in the chopped garlic and tomato paste and saute for another minute, until the tomato paste is distributed and garlic is tender but not burnt. Pour in the red wine and allow to reduce for a minute, using a wooden spoon to scrape the bits off the pan. Then pour in the stock and nestle the short ribs into the liquid with any leftover meat juices. Season everything with a good sprinkling of salt and pepper and throw in the bay leaves, thyme and oregano. Cove the pot and place in the oven for about 2 1/2 hours. At the 2 hour mark, check the meat for fork tenderness. If it's still a bit too stiff, cook for another 20-30 minutes. Once the short ribs are done, remove from oven and allow to cool for a few minutes. There will be a lot of fat that has rendered, so you can do 1 of 2 things. Either use a spoon and skim the fat that floats to the top. You can tell the difference by the look and color, it will be more clear and slippery. Or, you can remove the meat and vegetables and pour the sauce in a bowl and chill, which will lead the fat to solidify at the top, remove fat and afterwards warm everything together. To make the parsnip mash, add chopped parsnips and potato to a pot of water and boil until both are very tender. Drain and place back in the pot with Greek yogurt (or sour cream, a good grating of Parmesan and salt and pepper. Mash everything together and taste for seasoning and adjust as preferred. I also feel like I can make food better than most restaurants but sometimes I just don’t want to, you know? Laziness wins the day sometimes! 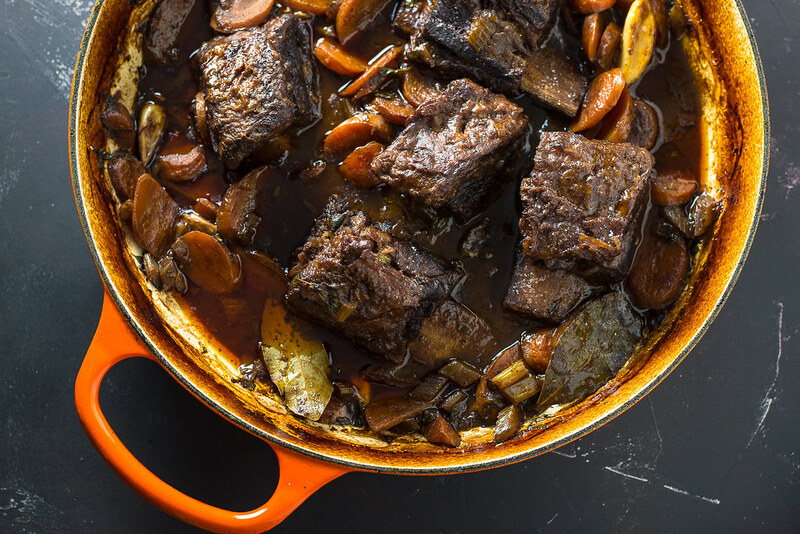 But these short ribs look delicious and totally doable. Love it! Hoooly yum. This looks BEYOND amazing- simple ingredients that create incredible flavors! Need to try! Thanks so much Karly!! Yes simple can be so full of flavor! !